Decks may be made from dozens of different kinds and types of woods and non-woods. Non-woods includes plastics, composites and combinations thereof. To be sure, there are pros and cons about virtually everything, including how to build a deck. Only a few will be discussed here. Please don’t get wrapped up in the technical aspects. It’s only provided to help you make an informed decision. The best decision-making tool is simply what makes the most sense. Then ask yourself what will give you the best bang for your buck? After you’ve answered these two questions, then look at the technical stuff. Deckster does not condone eco-terrorism or clear cutting. Eco-terrorism is the premeditated and sometimes violent guerilla tactics used to prevent the harvesting of timber. Clear cutting is an outdated method of harvesting still used occasionally where several acres of land are stripped bare and left open to the elements. Both the United States and Canada impose heavy fines and other penalties on lumber companies that ignore their responsibility of maintaining a home for forest-dwelling animals and don’t reseed cut areas. Currently more trees are being planted than are being cut for use and export. Let’s get a few generalities out of the way first. Synthetic wood is not structurally stable. Do not use it in any structural capacity. You may use it for the decking only, and even then you need to compensate by adjusting the spacing of the supporting joists. You can check online for the manufacture’s guidelines or your local lumberyard or the Building Codes office of your local government. Unfortunately, there is no independent body that can provide unbiased information on span ratings or structural analysis. The information provided is taken from product literature. Synthetic woods have not been around for very long. One inherent problem with synthetic woods is when a traffic pattern is worn into the textured surface, it can never be repaired. Unbiased analysis and comparisons are available with wood since it has been around a little longer (as in a few thousand years). Your substructure can be any hardwood; Southern Yellow Pine and Douglas Fir are the most common. All wood is categorized as being either “softwood” or “hardwood”. What’s the difference? The simplest answer is if the tree has needles, (called a conifer) it’s a softwood. If a tree has leaves, (called a deciduous) it’s a hardwood. Please keep in mind these are generalities. Besides needles and leaves, the difference has to do with structural integrity. Hardwoods have a tighter grain pattern, thus they can support greater weights and stresses. Softwoods are easier to cut and shape for decorative accents. The grading of woods is based on only one “face”, not the entire piece. This is all about aesthetics. Cypress is a softwood that usually is classified with hardwoods. Its natural oils make it highly resistant to moisture that can cause decay. The #2 and Better grading usually has a more rustic appearance due to its larger tight knots. The Select grade is clear and must be special ordered. No special fasteners or nails are necessary. The coloring can vary from light to reddish brown. It is considered superior as far as durability, cracking, weathering, resistant to decay, rot and mildew. It’s also easy to work with. It is usually a pale yellow white. Redwood is a softwood that is graded from the best, Clear All Heart, to the lowest, Construction Common. There are five different grades. No special fasteners or nails are required. Its natural oils make it highly resistant to bugs. Its coloration can vary from a light cherry to nearly as dark as mahogany. It’s easy to work with, almost never warps and is relatively lightweight. Like Cedar, it holds stains and sealers quite well. It will weather to a grayish color quickly. Treated lumber comes in several flavors. It always has a greenish tint. It is usually pressure-treated. It can be either Yellow Pine or Douglas Fir because these two species of wood accept the pressure treatment process the easiest. They are at the bottom end of the hardness scale. White Pine, by the way, is at the top end of the softwood scale. As mentioned earlier, this calendar year marks a transition from wood treated with arsenic to kill bugs to wood treated with another type of fungicide called Quat, which is arsenic-free. However, the old stuff, Chromated Copper Arsenate may still be used in non-residential applications. By the way, it has been in use since the 1940’s. The EPA is not recommending that neither existing structures nor the surrounding soil be removed or replaced. C.C.A. may still be legally sold until supplies run out. In residential applications and using the new Alkaline Copper Quat treated lumber, different nails and fasteners must be used. The chemical makeup of this new combination is highly corrosive on metals. 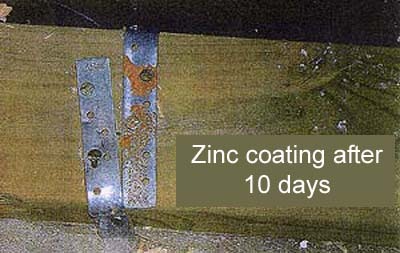 Remember to ask about the hardware coating when you buy ACQ lumber. The ACQ-treated lumber will fade to a brownish-gray in about five years. Do not burn or bury any treated wood. Don’t grind it up for use as animal bedding. Don’t use it around beehives where it may come in contact with the honey. Don’t make a habit of inhaling the sawdust. Dimensional lumber has nine different grades ranging from Dense Select Structural to #2 Non-Dense. Western Red Cedar is the most common of all the cedar woods. It has the same workability, weathering and stability characteristics as Redwood. Its grading goes from Clear Vertical Grain to Standard and Better. Its coloration is that of a rich, earthy red. Different Cedar Associations grade their material differently thus there may be five or six different grades from top to bottom. It is a softwood that’s easy to work with, is brittle, tends to split, almost never warps and is lightweight. It will scratch and dent very easily. It also burns very easily. Cedar affords a high degree of insulation in roofing and wall applications. Most cedar comes from Canada, which is currently at war with the USA over tariff restrictions concerning lumber imports. Canada supplies the USA with about 1/3 of all its lumber requirements. This website remains apolitical in this debate. Geodeck is made with recycled materials. It is available in Camel and Pewter colors. It is a hollow construction that does not require special tools or fasteners. It comes with a 20-year limited warranty. 3/8” spacing must be allowed for expansion and contraction. Use stainless steel fasteners only. Boards are available in 12’0”, 16’0” and 20’0” lengths. Profection has a reversible textured and wood-grained surface. It is made with high density polyethylene. It meets with the Americans with disabilities Act requirements. It is made with recycled wood and polymers. It is available in gray, cedar and redwood colors and has a 10-year warranty. Do not fasten within 1” of the edge of the boards. For use as stair treads, made sure the carriages are no more than 16” apart. Oil based paint may be applied after 90 days. Trex was the first synthetic wood on the market. It is made of approximately 50% reclaimed hardwood sawdust and 50% recycled polyethylene plastic. It is the only non-wood listed with the three major U.S. building code agencies. It is available in four colors. There is a light and dark shade of gray as well as a light and dark brown. The boards are only available in 12’0”, 16’0” and 20’0” lengths. TimberTech is available in both hollow and solid forms. The manufacturer claims the tongue and groove hollow plank can actually span 24’. It is available in 12’0”, 16’0” and 20’0”. The regular 5/4 and 2x6 planks can span 16” on center. They also offer a deck cover that installs directly over an existing deck. Included in their engineered deck system is a starter strip and end cap. Crosstembers is a composite blend of hardwood and polypropylene which gives it greater strength. It contains no recycled polyethylene products. This product can span 24" between supports. Its available in five colors. It uses a concealed fastener system. It's covered by a 20 year limited warranty. It is available in 12', 16' and 20' lengths.